"These are the generations of the heavens and of the earth when they were created, in the day that the LORD God made the earth and the heavens, And every plant of the field before it was in the earth, and every herb of the field before it grew: for the LORD God had not caused it to rain upon the earth, and there was not a man to till the ground. But there went up a mist from the earth, and watered the whole face of the ground. And the LORD God formed man of the dust of the ground, and breathed into his nostrils the breath of life; and man became living soul. And the LORD God planted a garden eastward in Eden; and there he put the man whom he had formed. And out of the ground made the LORD God to grow every tree that is pleasant to the sight, and good for food; the tree of life also in the midst of the garden, and the tree of knowledge of good and evil." 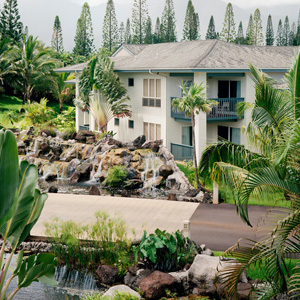 Countless honeymoons are spent on Kauai, and superficially it is truly a paradise-garden island. Yet the innocence of the landscape, like that of humanity itself, has already been lost. Kauai is lush with issues of environmentalism and global warming, development and tourism, imperialism and colonialism, agriculture and invasive species. Its paradisaical landscape contains a morality in which there is a potent mixture of good and evil at play, and to differentiate between the two is not always easy, or even possible.